I realize the big day is still a couple days away, and you may have plans to pack in all your favorite naughty foods before the year officially ends. 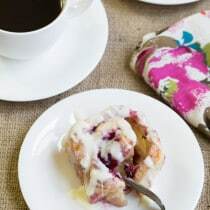 However, I wanted to throw out my very first healthy recipe for 2016 so you have something to look forward to, other than the hope of skinny legs by spring. 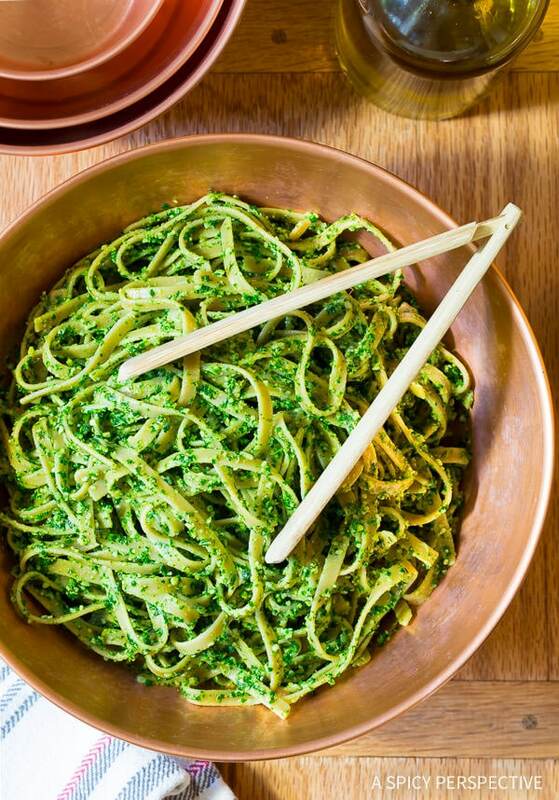 Of all the pesto recipes I’ve made over the years, this simple 5-Ingredient Kale Pesto Recipe is high on the list. It’s packed with vitamins and minerals from fresh green kale, along with healthy fats. That makes this pesto decadent enough to taste like a comfort food, yet fabulous for a low carb or vegetarian diet. 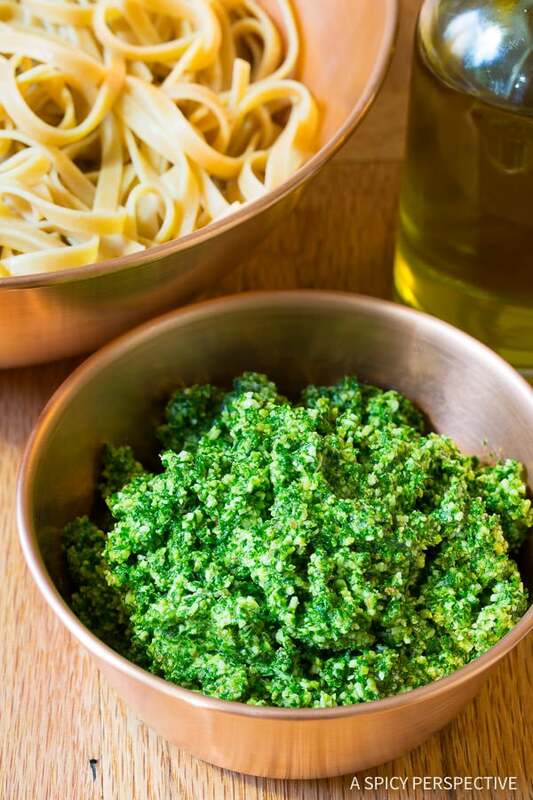 In fact, you could even omit the parmesan cheese, substituting chopped cashews in its place, to make a “paleo” and “vegan” version of this kale pesto recipe! 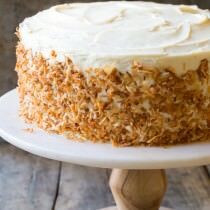 That makes it 5-Ingredient, 5-Minute, and 5 Stars, in my opinion. 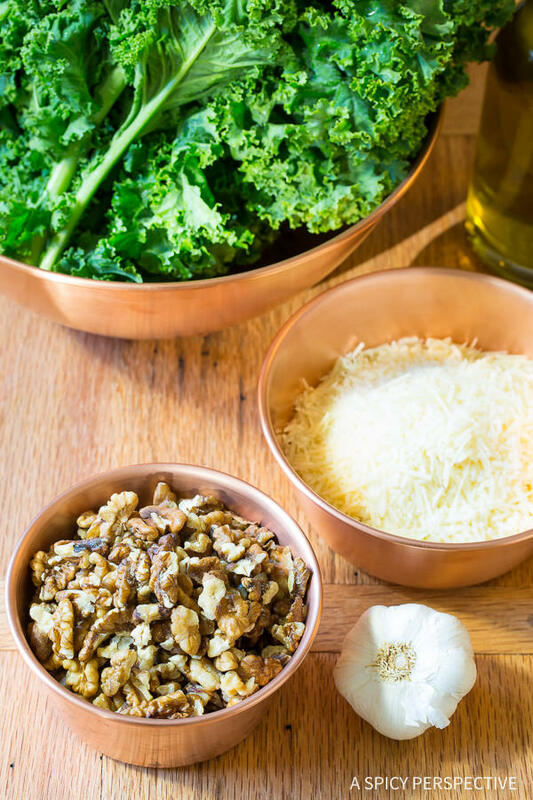 Simply place chopped kale, chopped walnuts, parmesan cheese, garlic, and olive oil in a food processor. Pulse to combine. Then salt and pepper to taste. 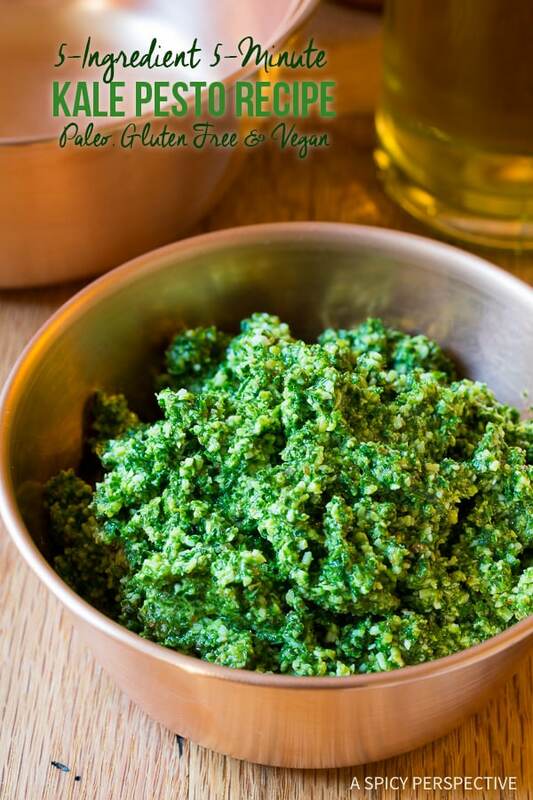 You can use this kale pesto recipe as a party dip for New Year’s Eve, if you’re as excited about it as I am. 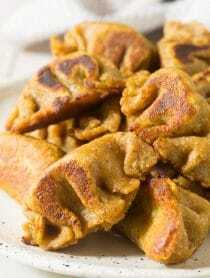 Or use it in the coming weeks as a spread for sandwiches, tossed into salads, and even tossed with hot whole grain (or gluten free) pasta for a quick healthy meal. If you were ever going to get your kids to enjoy kale, this is the way to do it. See? There is something healthy that you can look forward to in 2016. Cleaning up your diet won’t be so bad this month… I’m on your side. We’ll be offering up tasty guilt-free dishes all month. 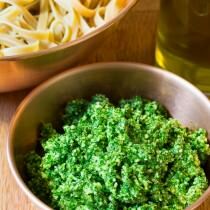 Easy 5-Ingredient 5-Minute Kale Pesto Recipe! Fresh, healthy, and packed with flavor. 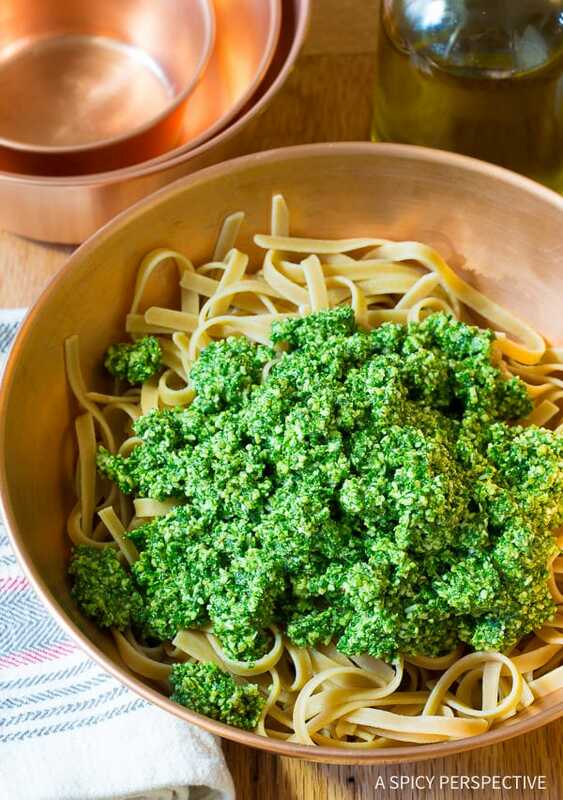 Use this homemade pesto recipe as a dip, spread, or toss it with pasta. Place all the ingredients in a large food processor. Pulse to fully combine. 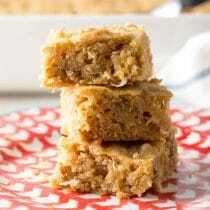 If the mixture is clumpy add 2-4 tablespoons of water and pulse again. Taste, then salt and pepper as needed. I do massage kale for salads, to soften the texture, but in this case its unnecessary. I grew up with homemade basil pesto. Our kale is growing amazing trying to find a way to preserve some. Wondering if you can water bath can the Kale Pesto? 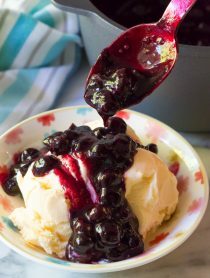 I made this recipe and I can’t stop eating it!!! That being said, any idea of the the calories and nutrition facts are??? Hey Karly! We don’t provide nutritional facts because most of the tools we’ve found vary so much, it would be hard to give you honest information. However to give you a rough estimate, the “My Fitness Pal” app says that Homemade Kale Pesto is 40 calories and 3 grams fat per tablespoon. This was very good! I made some Garlic/parmesian made a sauce in the pan with reg. almond milk then added a large spoon full of pesto. 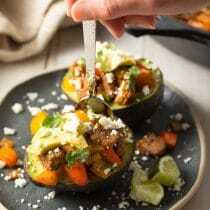 I then poured that over my spiralized medley of Zucchini, yellow squash and butternut noodle squash , and boy was that delicious! Any substitution ideas for the walnuts? We have a peanut/tree nut allergy in our family. Pine nuts are a traditional ingredient in pesto. I have just read an article about sunflower seeds that mentioned them being used in pesto as an inexpensive substitute for pine nuts. ooo This is fantastic! I couldn’t leave out that parmesan cheese though! haha I would miss it too much! can’t wait to try this over some fresh pasta! 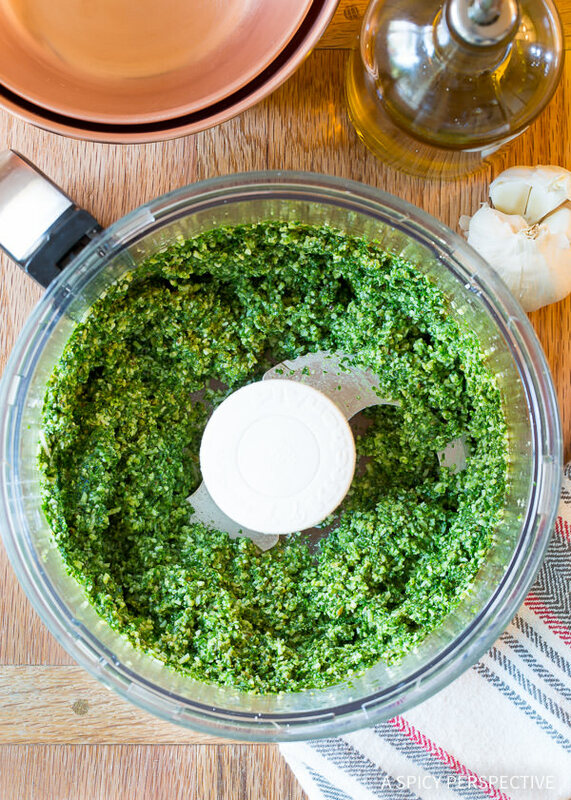 I’ve never made kale pesto before – and I forget how versatile it is! 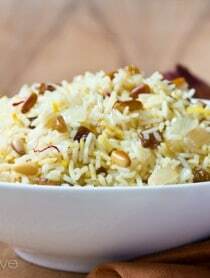 So simple, healthy and tasty! Great way to sneak in some healthy greens!